In today’s society, where Instagram fitness models rule the roost and every chain restaurant has not only a vegetarian option but a vegan one too, taking note of your carbon footprint is important for both individuals and brands. It’s the little things that make the biggest difference, and what better way to show off your dedication to reducing waste than by swapping your standard hang tags for an eco-friendly version? A handmade eco-friendly tag can be just as flexible as a regular tag, with a variety of shapes, sizes, finishes and colours to choose from. You can order unbleached, hand dyed or even custom designed to match your branding. 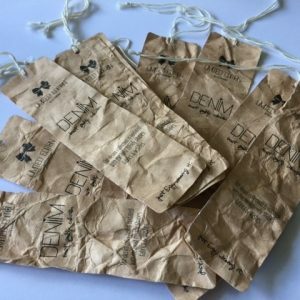 Alternatively, try a mix of recycled paper swing tags to bring a unique touch to each and every garment. If you’re looking for something a little different, seed paper hang tags are sure to make your brand stand out from the crowd. These quirky handmade paper tags can be planted by your customers after use, and offer the benefit of not only being a unique and interesting selling point for your items, but a lovely gift for shoppers – and, eventually, a sweet floral reminder of that special purchase every time they pop into their garden. Our handmade plantable seed paper features the highest germination percentage. We offer eco-friendly recycled hang tags in natural brown colour, white, and any other colours. These are recyclable hang tags using 100% recycled paper. Our eco-friendly woven labels are made by soft natural cotton threads. The minimum order requirement is 1000 labels. Contact us today. We have a wide range of eco-friendly hang tags including seed papers, recycled papers. And the popular beautiful handmade paper with added flowers pedals, seeds and leaves.